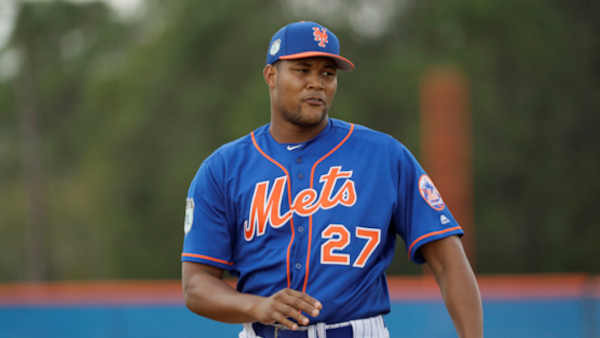 NEW YORK -- New York Mets All-Star reliever Jeurys Familia accepted a 15-game suspension under Major League Baseball's domestic violence policy, discipline stemming from an altercation last October. The suspension, announced Wednesday, is the fifth and least severe under the policy, which was agreed to in August 2015: New York Yankees reliever Aroldis Chapman (29 games), Colorado shortstop Jose Reyes (51 games) and Atlanta outfielder Hector Olivera (82 games) were penalized previously. The suspension stems from Familia's Oct. 31 arrest on a simple assault charge. Prosecutors later dropped the charges. Familia's suspension will begin on opening day, and he stands to lose 1/12 of his $7,425,000 salary. He is eligible to continue to participate in all spring training and exhibition games and activities leading up to opening day. "The evidence reviewed by my office does not support a determination that Mr. Familia physically assaulted his wife, or threatened her or others with physical force or harm," baseball Commissioner Rob Manfred said in a statement. "Nevertheless, I have concluded that Mr. Familia's overall conduct that night was inappropriate, violated the policy and warrants discipline." Manfred said Familia has undergone 12 90-minute counseling sessions, and the counselor said Familia was willing to take steps to ensure he will not be involved in another incident. Familia also will speak to other players about his learning process and will donate time and money to organizations involved in preventing domestic violence. "With all that has been written and discussed regarding this matter, it is important that it be known that I never physically touched, harmed or threatened my wife that evening," Familia said. "I did, however, act in an unacceptable manner and am terribly disappointed in myself. I am alone to blame for the problems of that evening." Familia was charged after his wife, Bianca Rivas, made several frantic 911 calls to Fort Lee police in which she described her husband as "drunk." "My husband had a little bit of alcohol, and he's going crazy," Rivas said in the 911 recording, according to excerpts of a transcript published by NJ.com. A judge dismissed a charge in December after the player's wife told a prosecutor that her husband did not hurt her. Familia, a Dominican Republic native, set a Mets record with 51 saves last season. He previously was involved in an ad campaign for an anti-domestic violence group, which has since ended its relationship with him. Mets reliever Addison Reed is a likely candidate to fill in for Familia. He has 106 saves in a six-year career, only two since joining New York during the 2015 season.